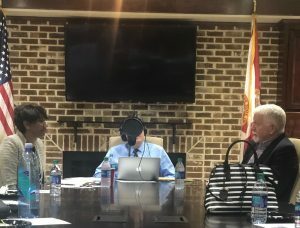 Heidi Otway, APR, CPRC interviews Political Icon Mac Stipanovich for Salter-Mitchell’s “Fluent in Floridian” podcast. 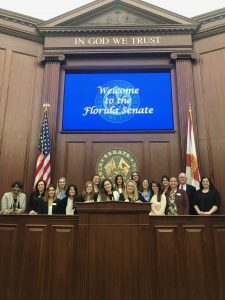 LeadershipFPRA Class III took over the Florida Senate Chambers March 28 as part of the program’s annual Government, Law & Ethics session in Tallahassee. The day started with Capital Chapter members welcoming the Class to their monthly meeting, featuring a panel of experts on the power of podcasting, including Salter-Mitchell President Heidi Oatway, APR, CPRC who later in the day turned the class into a live audience for Salter-Mitchell’s popular podcast “Fluent in Floridian” where she interviewed Florida political icon Mac Stipanovich and took questions for the lobbying legend from LFPRA members. It ended with a behind the scenes tour of the Florida Supreme Court, but not before a day packed with insights from true insiders. Special thanks go to April Salter, APR, CPRC, Colleen Thayer, APR, CPR and Amanda Handley, APR (an LFPRA Class II graduate) for facilitating all the arrangements. As well, thanks to Cap Chap President Kathy Schroeder and all the members who made LFPRA Class III feel right at home. LeadershipFPRA Class III taking a leadership role in the Florida State Senate Chambers. The goal of LeadershipFPRA is to provide leadership insights to help FPRA members become better equipped to lead in their careers, their communities and in FPRA. Many chapters and some individuals have generously provided scholarships to help defray costs for deserving members. Each year LeadershipFPRA grows and includes new and valuable experiences. Applications for Class IIII are being accepted now. Each class is limited to 21 participants. 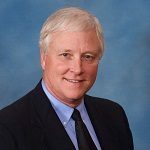 One of those positions is awarded to a member of the Joe Curley Rising Leader Award Class and if there are more than 20 applicants the LeadershipFPRA Board reviews all applications and identifies those to be admitted.